I want it to hit you in your guts." 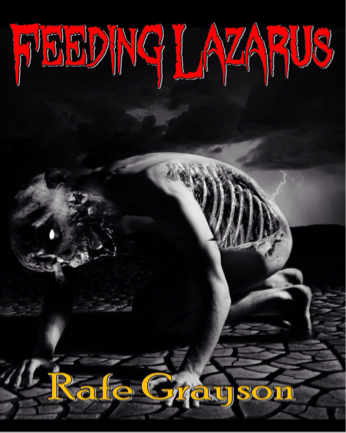 ENTER NOW to win a signed copy of my horror novel, "Feeding Lazarus!" Daniel awakens each day trapped inside two very real nightmares. At school, he plays the role of social outcast, suffering within a cycle of escalating torture at the hands of bullies. At home, the madness is more subtle, but is something even worse. He exists in a decrepit little world and dwells in filth. His father has been missing for years, the mystery of the man's disappearance somehow linked to a forgotten piece of tormented early childhood. In an attempt at moving on, his mother has brought a new man into their home—a sadistic and abusive monster who gets off on torturing her. When Daniel finds a dead body at an abandoned construction site—a withering corpse which appears to be returning to life—his world is going to change. But will this grisly discovery be the key to Daniel’s salvation, or is it yet another nightmare leading him further into darkness, ultimately guiding him into the very pits of Hell?